[Initial blog is from December 18th, 2018. Another year (almost) over and what have we done? Please find our report below for Humpback Whale numbers in our study area and a summary of the work achieved in 2018. First, for clarity, we are not reporting on the full number of Humpback Whales estimated to feed in British Columbia marine waters.. The best estimate for that dates back to research by Ford et al which concluded that, in 2006, the abundance for Humpback Whales in British Columbia waters was 2,145 whales. This estimate does not include 1st year calves. There will be an updated estimate as a result of the 2018 Pacific Region International Survey of Marine Megafauna (PRISMM). How many Humpbacks did there used to be off our coast? As you can imagine, there is poor data for this as no one was studying whales as individuals prior to the early 1970s. The estimate is that a minimum of 4,000 Humpback Whales existed just off the west coast of Vancouver Island in 1905. Legal whaling for Humpbacks ended by international agreement in 1966 and it is estimated that, by the 1970s, there were only ~1,400 Humpbacks in the WHOLE North Pacific Ocean i.e. not just off our coast. The area for which we are reporting is from the upper Strait of Georgia to northern Vancouver Island. To date, our team at the Marine Education and Research Society has identified 158 individuals who were in that area at some time in 2018 (this number may increase since we still have some data to process). The sub-area for which we have the longest dataset is northeastern Vancouver Island (upper Johnstone Strait, Queen Charlotte Strait and the inlets of the Broughton Archipelago). The graph below shows how sudden the increase in Humpbacks has been. Numbers have increased from just 7 individuals documented in this area in all of 2003, to identifying 86 in 2018. Note too how many of the whales are returnees to the area each year (compare the purple bar in the graph to the red bar). This indicates how strong the site fidelity of Humpbacks is. They generally return to the same area(s) to feed year upon year. Number of photo-identified Humpback Whales sighted off Northeastern Vancouver Island – specifically for upper Johnstone Strait, Queen Charlotte Strait and the inlets of the Broughton Archipelago. Data pre 2000 via Alexandra Morton. Note that we use both dorsal fins and the underside of the whales’ tails to determine ID. MERS Humpback Catalogue available at this link. For the Campbell River / Comox area, we catalogued 86 individuals that were there at some point in 2018. Of this number, 23 were also sighted around NE Vancouver Island. We emphasize how this work would not be possible were it not for the contribution of photos from naturalists, boaters and others who care. The photos, together with the location of sightings, not only aid our Humpback Whale population studies but also help in understanding how the whales use the area. With the number of Humpbacks so predictably being around central to northern Vancouver Island, it is essential that boaters are aware of how to avoid collision and what to do (and not to do) if entanglement is witnessed. Humpback Whales are much more unpredictable than the Orca many boaters are accustomed too. Please see www.SeeABlowGoSlow.org. Note that our research, conducted in collaboration with Fisheries and Oceans Canada, shows that approximately 50% of the Humpbacks in BC waters have scarring from an entanglement. This indicates how widespread a risk entanglement is but does of course not allow us to know how many whales become entangled and die since dead whales usually sink to the bottom of the ocean. It is even more difficult therefore to know how often whales die from injuries related to boat collision. It is now thankfully the law that collisions and entanglements must be reported. We have included a photo at the end of this blog showing a whale injured as a result of a boat collision. This is a graphic image. It is easily understood how such collisions with whales are also a human safety issue. Please see below for a summary of our further efforts to understand and reduce threats to whales for 2018. This has been achieved with less than three full-time paid positions. Such efficiency is possible as a result of extensive volunteer efforts from our team and a broad community of support. Thanks to all who made this possible. Co-hosting an entanglement workshop with the Coastal Ocean Research Institute / Ocean Wise, Fisheries and Oceans Canada and Sealife Response Rehabilitation and Research to help participants learn how to report, document and help assess entangled whales. Warning – graphic image alert. The photo below is of Raza the Humpback Whale who is often around the Discovery Islands during the feeding season. The photo is from October 20th, 2018 in Calm Channel (between Sonora and Stuart Islands) with the propeller scars appearing to be recent. It is thanks to the observations of Ryan Stewart that the injury was noted, documented and reported. Presumably no boater wants to put themselves and whales at risk but too many are still unaware of how the increase in Humpbacks off our coast necessitates increased knowledge and modified boater behaviour. Every boater should have the Incident Reporting Line number 1-800-465-4336 programmed into their phones to report incidents of concern. All should be familiar with the further content at www.SeeABlowGoSlow.org. We have shared Raza’s reality in the hopes that this image is compelling for more boaters to become aware. Photos from one of the known vessel strike incidents in 2018. Click here for examples of the severity of human injuries and material damage resulting from collisions with Humpback Whales. Ford J.K.B., Rambeau A.L., Abernethy R.M., Boogaards M.D., Nichol L.M., and Spaven L.D. 2009. An Assessment of the Potential for Recovery of Humpback Whales off the Pacific Coast of Canada. DFO Can. Sci. Advis. Sec. Res. Doc. 2009/015. iv + 33 p.
Here’s another story of a survivor. It’s an update that will likely be of great interest as Lucky is one of the most easily identifiable Humpbacks in our study area. The latest that we can confirm, thanks to the photo below from Kurt Staples of Eagle Eye Adventures, is that Lucky is female. But before we explain that, let us give you some of her backstory. Lucky? One thing that clearly makes her so easy to identify is the scarring on her tail. In this case, her misshapen tail with all scars is not the result of entanglement or vessel strike. Lucky is the survivor of an attack by Killer Whales / Orca. This attack happened well before she was first documented in 2012. MERS catalogue photos for Lucky. Catalogue is available at this link. How do we know that? Because the spacing between the rake marks is wider than than the spaces between Killer Whales’ teeth i.e. the scars grew further apart as Lucky’s tail grew. Note that there has never been a confirmed case of Bigg’s Killer Whales (mammal-eating population) killing a larger Humpback but Lucky, who was attacked as a calf, is . . . lucky to be alive. This very fitting nickname was put forward by Leah Robinson of OrcaLab who was the first to document Lucky back on November 14th, 2012. The other thing that makes Lucky more easy to ID as an individual is that she is the Humpback Whale in our study area that almost exclusively solo bubble-net feeds, using a net of bubbles to coral juvenile herring. For clarity: she is not the only one that uses this feeding strategy in the area but she IS the one that appears to do so almost exclusively. The other Humpback Whales primarily lunge-feed (with some individuals also occasionally trap-feeding and/or solo bubble net-feeding). Note that Humpbacks on other parts of our coast (British Columbia’s central coast, north to Alaska) are specialists in bubble-net feeding as a team but this is not a good strategy in an area with a lot of current since the bubbles will not remain intact. . Since 2012, Lucky has very predictably been seen solo bubble-net feeding around NE Vancouver Island in back-eddies or on slack tide i.e. where/when the bubbles cannot be blasted away by current. She has also occasionally been sighted further to the south near Campbell River (this is where Kurt photographed her). The wonderful video below of Lucky solo bubble net-feeding is from another of our OrcaLab colleagues, Megan Hockin-Bennett / Wild Sky Productions. And now – how can we now confirm Lucky is female? Without DNA testing or the presence of a calf, it is very difficult to discern gender in Humpbacks. They do not have gender differences that can be easily seen. We have to get a look at their undersides and this opportunity does not present itself very often. Even when Humpbacks clear the water when they breach, the pelvic area is difficult to see because it is most often covered by water. See photo below. KC the Humpback breaching which shows how the pelvic area cannot be seen because of the “skirt” of water. This is why we get very excited when Humpbacks lie on their backs and “tail-lob”. THEN, if the whale’s tail is far enough out of the water, the pelvic area is visible. The females have a small feature known as the “hemispherical lobe”. Males do not. See below (click image to enlarge). In this story about Lucky, you’ll note again how the knowledge we have about a whale is so often the result of a community of data contributors. We can put the pieces of the puzzle together but could not do it without this community and the further support of many. Thank you. Note that Lucky’s temporary catalogue ID is “BCZuk2012#3”. We are working with colleagues to update the province-wide catalogue for Humpbacks sighted off the coast of British Columbia (which was maintained by Fisheries and Oceans Canada but has not been updated since 2010). Once we have finished the matching work involved with this, Lucky will get a permanent catalogue number in the province-wide catalogue. 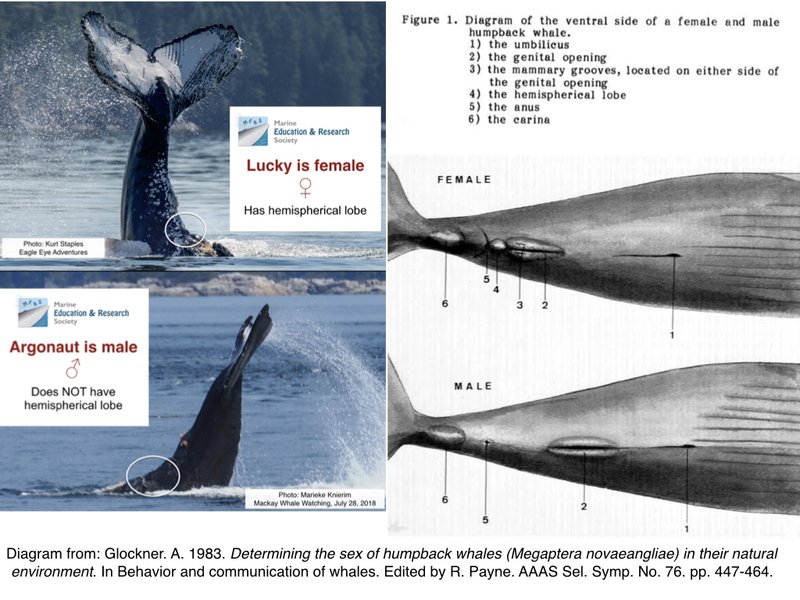 Our research on Humpback Whale trap-feeding has now been published in Marine Mammal Science. We first documented this novel feeding strategy for two individuals around NE Vancouver Island in 2011. We now know of more than 20 humpback whales who have learned to sometimes use the strategy on smaller, more diffuse schools of juvenile herring. Trap-feeding is where some humpbacks set a trap for juvenile herring when the fish are in small, diffuse schools. The fish then collect near, or in, the mouth of the humpback to escape predation by diving birds (most often common murres and rhinoceros auklets). The humpbacks then spin and/ or use their pectoral flippers to push the fish into their mouths. This feeding strategy uses less energy than when humpbacks lunge-feed on greater concentrations of juvenile herring. Trap-feeding compared to lunge-feeding. Graphic: Uko Gorter. Humpbacks are also well known for “bubble-net feeding”. With this strategy, teams of whales work together to coral fish and this includes a member of the team blowing a net of bubbles to stop the fish from escaping. This is not a strategy employed by humpbacks around northeast Vancouver Island as the current would dissipate the bubbles. It is a used by humpbacks around BC’s central coast and further to the north. Only occasionally will individual humpback whales around northeast Vancouver Island use bubbles to coral fish (not teams) when there is no current i.e. on slack tide or in a back eddy. MERS’ research supports that the humpbacks of northeastern Vancouver Island are lunge-feeding specialists on juvenile herring, with some of the whales having learned this new feeding strategy – “trap-feeding” when the fish are in smaller, less concentrated schools. To contact MERS for more information about trap-feeding, please email info@mersociety.org. Video of trap-feeding where a seal escapes from the Humpback’s mouth. Compilation of MERS trap-feeding footage. Want a glimpse into the world of trying to study Humpbacks as individuals? It’s key to everything we do. If we can’t recognize the whales as individuals, we can’t count them; or know their range; or determine rate of entanglement; or study what feeding strategies they use, etc. etc. etc.! Often it’s easy. Sometimes it’s not. In this blog we share two examples of how puzzle pieces come together so that we can better understand Humpback Whales. It’s hoped that these examples give a sense of how much effort and collaboration is involved in studying these far-ranging giants and – how the contribution of sightings can provide us with essential puzzle pieces. On the evening of August 25th two Humpbacks were in Comox Harbour and generated a lot of concern. Boats and jet skis were reportedly travelling at high speed near the whales. Public concern about the safety of the whales led to media attention and additional opportunities for us to provide education about safe boater behaviour around Humpbacks. We are so grateful too that people cared enough to sponsor MERS “See a Blow? Go Slow!” signage for Comox Harbour. It was an important sighting and we hoped to be able to determine who the whales were. Thankfully, Peter Hamilton of Lifeforce contacted MERS with photos of the whales. The following fluke shot allowed Alison Ogilvie of MERS to ID one of the whales. The photo shows enough features of the whale’s tail for Alison to recognize “Towers” (BCX1239). ID photos from the MERS Humpback Whale ID Catalogue for NE Vancouver Island. We nickname the Humpbacks for distinctive features. In this case, see the two distinctive peaks on the right side of the trailing edge of the tail that inspired the name “Towers”? (See our ID photo above). But the second whale – who was s/he? While we can often recognize individual Humpbacks from their dorsal fins, we had never documented a whale with this dorsal fin before. Whale #2. Even though the whale has a very distinctive dorsal fin, we could not ID the whale as we had not documented him/her before. Months passed. Then, on December 11th, we got reports of two Humpbacks travelling past Alert Bay to the north. Jared Towers of MERS and volunteer Muriel Halle were able to get ID photos. Look at the distinctive dorsal fin! It’s the same whale that had been in Comox Harbour on August 25th. They were able to get a fluke shot whereby we now have the ability to recognize this whale in the future (see below). S/he has been nicknamed “Bullet” for the distinctive circle-like shape on the trailing edge of the right fluke (upper third). Even though this is an adult Humpback, the August 25th sighting in Comox Harbour may be the first known documentation of this whale. To date we do not know of any prior sightings by our colleagues studying Humpbacks in other areas on BC’s coast. We anticipate however that we will get more pieces of the puzzle in the future. Kappa migrates to Hawaii! Documented in March 2004 in Maui as part of the SPLASH Project. Kappa is female! She was sighted with a calf in Maui in 2004 and was seen repeatedly with the calf in BC as well from July to September 2005. This includes documentation off SW Vancouver Island by Brian Gisborne for Fisheries and Oceans Canada. Addition sightings include her repeatedly being in Washington State. The first documentation there was in October 1997 as reported by the Cascadia Research Collective (catalogued as CRC-13576). The last known documentation of Kappa in Washington was on December 4, 2016 by Heather McIntyre of Maya’s Whale Watching as relayed to the citizen science site known as “Happy Whale“. And then . . then there was this past December 30th. Again we got reports of two Humpbacks traveling past Alert Bay, heading north. Again, Jared was able to get photos. When those photos were relayed, one of us may almost have fallen off her chair. It was Kappa, the first known sighting of her around NE Vancouver Island in 20 years! See below for the ID photos resulting from that sighting. Kappa was nicknamed for the marking in the shape of a “K” on the lower left part of her tail. Kappa is Greek for the letter K. See the marking? BUT who was the whale with her on December 30th? That whale didn’t fluke. We only have a flank shot. Here we go again – another puzzle we will hopefully be able to solve. Piece by piece by piece . . . contributing to the important and intriguing picture of understanding – and protecting – North Pacific Humpbacks. Unknown Humpback traveling with Kappa (BCX0158) on December 30, 2016.